but I can't go nap peacefully until I double-check that you know. Are you obsessed with chai as I am? and so you can only make a pit stop at Starbucks every time you walk by? You just mildly appreciate chai? That's okay. This is for you too. 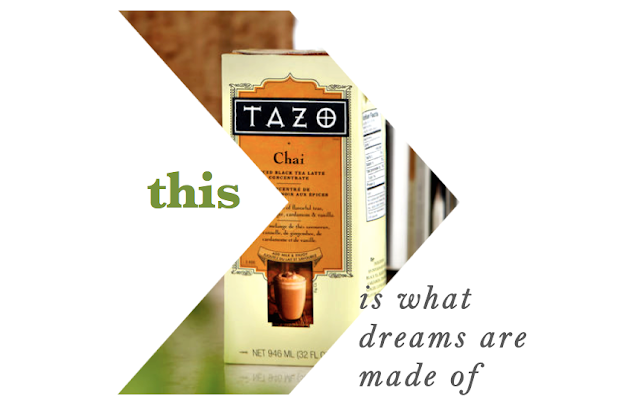 This is Tazo Chai concentrate and it tastes exactly like Starbucks chai. pour in an equal amount of this concentrate, and just heat it up. Or pour it over ice. It's same kind they charge you around 4 whole dollars for. and each container lasts you around eight servings. But no, then I really figured it out and it's only about 38 cents a serving. and just sip to your heart's fancy. Disclosure: No one paid me to say any of this. I just really like delicious drinks & products that make it easy for me to have some. Love chai tea! Never tried the one from a box, but I will need to test it out! Can you believe I've never had it? I love those finds that are exactly what you love at a fraction of the cost! i love chai! all you need is a cup of chai and a good book! i wish they would start selling this in my country! I am totally with you on the tea! Do you know they make k cups now?? SO GOOD! I'm a sucker for anything Chai... it's so comforting! omgosh i'm obsessed w/ chai tea!!! i didn't know they had this at costco!!! i will definitely be checking this out before i go back to germany :p! thanks for the tip hon!! what??? i didn't know they sold it at Costco?! I usually get my Tazo teas from Target. Do they have other varieties at Costco or just the Chai? I'm all about the Berryblossom White tea.